This collection of essays on classical Rome and its physical and literary legacy — by a distinguished group of philologists, art historians, and archaeologists — pays tribute to the career of Professor Katherine Allston Geffcken. Contributors to this volume represent two successive academic generations as well as a wide variety of topics and analytical approaches. Many of the essays offer new readings of major Latin literary texts. Others illuminate the artistic, architectural, and archaeological achievements of the urbs antiqua aeternaque itself, including several that deal with the history of the American Academy in Rome. The World History Shelf Rome and Her Monuments Sheila K. Dickison and Judith P. Hallet (Editors) Bolchazy-Carducci Publishers, Inc. 1000 Brown St., Unit 101, Wauconda, IL, 60084 0865164576, $75.00, www.bolchazy.com Rome is justifiably considered to be the single common political and cultural ancestor of all of western civilization, so it's no wonder why there is so much study into it. 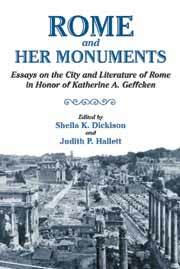 "Rome and Her Monuments: Essays on the City and Literature of Rome in Honor of Katherine A. Geffcken "is a grand and scholarly discussion of Rome, her legacy and everything that contributes to it- the literature, the architecture, the art, and more. To get the most comprehensive and complete discussion of Rome possible, Editors Sheila K. Dickison and Judith P. Hallet stopped at no length to get the leading philologists, art historians, archaeologists, anthropologists, and more to contribute to this deftly compiled work. "Rome and Her Monuments: Essays on the City and Literature of Rome in Honor of Katherine A. Geffcken" is the output of some of today's greatest scholars and it shows it's origins well- it's highly recommended for college library collections in need of a great reference on Rome.